Create a unique and sentimental gift that will leave a forever lasting impression on your true love. 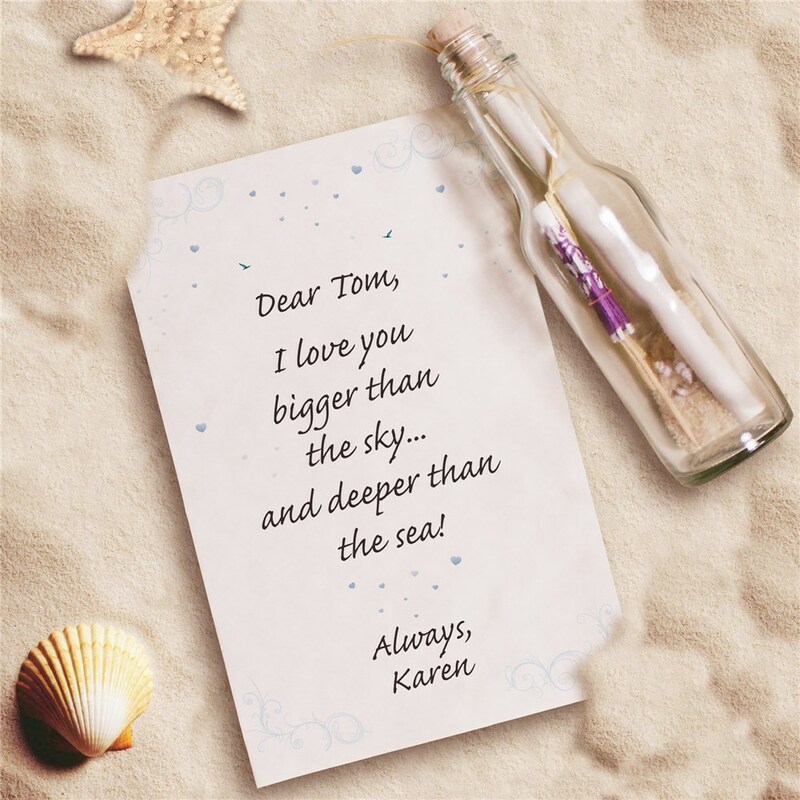 Our Personalized Love Message In A Bottle describes the love you feel as being bigger than the sky and deeper than the sea. Each Romantic Message In A Bottle Gift makes a wonderful gifts for any occasion. The 6 1/2" glass bottle comes with sand, seashells, beach umbrella, and your very own 2 line ending sentiment. Printed on parchment paper with heart graphics, then rolled, tied with a ribbon and corked on top. Can be shipped to you or directly to your sweetheart. Includes FREE Personalization! Personalize your Message In A Bottle with who it's to and a 2 line ending sentiment. Bought it for my husband, he loved it. The product arrived quickly and well-packaged, I'll recommend it to others. At GiftsForYouNow.com, you will find a large collection of Personalized Couples Gifts that are perfect for romantic evenings and celebrating wonderful occasions such as Valentine’s Day, Weddings or Anniversaries. From Personalized Love Throw Blankets to romantic keepsakes and more. Each gift you choose beautifully displays the love you both feel for each other each and every day. When you want to find that romantic gift for the person you love the most, shop GiftsForYouNow.com today. We also have a large collection of Unique Valentine’s Day Gifts that can be personalized to fit your exact needs. Browse through our collection of Romantic Keepsakes, Loveable Personalized Teddy Bears, Valentine’s Day Pillowcases and so much more.